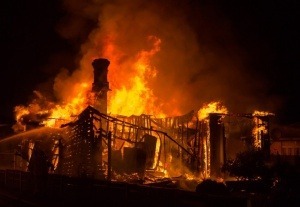 A cigar is the cause of this fire, but as we have seen before, fires at home can happen because of several reasons. In most of the fires, there is a long period of time since the smoke appears until you can see the flames. In the video we show what could be a real situation during a fire at home. – 30 seconds after the first flame the sofa starts to catch fire. After that, the fire expands throughout the room. If this happens and you see it, call the emergency number and leave the house. – 1 minute and 4 seconds the material of the sofa melts now the fire is also in the carpet. The smoke is starting to fill the room. – 1 and 23 seconds, there is not any evidence of the fire on the top floor and the stairs. Everything seems going well but in the lowest floor the masacre that will burn the whole house is starting. – 1 minute 47 seconds, some smoke starts to appear on the floor above. – 1 minute and 50 seconds, the detector works and sounds alerting all the tenants of the house. – 2 minutes 48 seconds, the black smoke begins to fill the first floor. Downstairs, in the room, the smoke reaches up to 1 meter 20 centimeters. – 3 minutes 3 seconds, the lamp burns and also the other sofa. The smoke reaches up to 1 meter and the room is at 280ºC. No one can survive with this conditions. – 3 minutes and 41 seconds, the temperature rises to over 750ºC and a flashover occurs, the windows break and the whole house is filled with flames. 2 minutes after the detector on the floor below sounded, you can not see anything already inside the house. – 4 minutes and 33 seconds, now flames can be seen from outside. If this happens at night, it would be the first thing to be be seen from outside. The flames climb the facade. When firemen arrive to the house, it is completely on fire and full of smoke. They could not have rescued anyone who had been trapped inside the house. Not all fires are like this one, there are faster ones or slower ones. If there is a fire in your home, leave immediately and call the emergency number. To prevent this fires from happening at home, take the proper precautions and install a good fire protection system. The passive fire protection consists of construction elements and special products arranged to prevent the start of the fire, prevent it from spreading, prevent it from seriously affecting the building (structural protection) and facilitate the evacuation of people (luminescent signaling) and a safe performance of the extinguishing equipment.